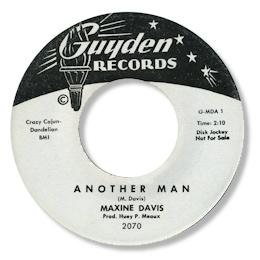 I’d say that most of Maxine Davis’ tracks were more pop/teen than soul orientated, Guyden 2089 is pure country, but there were a couple of tracks she cut that really hit the spot. The dancers like the Motown sound-alike “Before I Leave Him” but it’s too twee for me. Much better was the rocking New Orleans R & B of “Another Man” on which she gets some grit into her delivery rather than trying to sound like Anette Funicello. 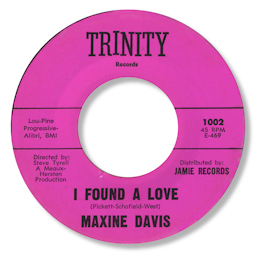 The other track on which she gets low down is her version of I Found A Love especially when she sings about “The Way The Man Kiss” and “The Way He Holds Me” after the second chorus. This is my favourite female cut to this great number. Maxine’s discs were cut in Houston for Steve Tyrell and the odious Huey Meaux.